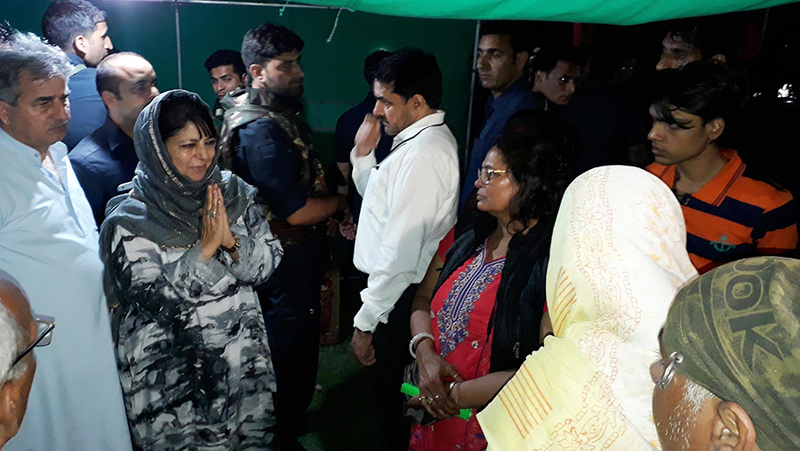 CM Mehbooba Mufti with the families of Amarnath victims at Islamabad hospital. The man who made the fundamental difference in the entire crisis starting with the attack on the Gujarat bus was not an ordinary man. Salim Mirza Gafoor Shaikh, a driver, who drove somebody’s bus to Kashmir, for the fourth pilgrim season to Baltal. Carrying almost sixty pilgrims, Sheikh’s bus had a tyre puncture, in city outskirts that delayed their travel to the Vaishno Devi by three hours. Incidentally, the bus followed a police bunker, with 200 meter gap, and when they reached Botnegoo, not far away from Khanbal garrison, there were instant cracker sounds. “Bullets started raining and the right side of the glasses cracked one after another, the man sitting on my left was hit by three bullets” Salim, now a prime time celebrity, told reporters. “There were shouts and cries as passengers wanted me to stop. But God gave me strength to keep moving, and I just did not stop.” The bus (GJ09Z 9976) was chased, some pilgrims said but it sped away. Salim did not stop, he accelerated the speed instead. “After some distance, I felt a few soldiers on road but I knew they have no match with the militants, who might have been three to four,” Sheikh said. “I have been coming to Kashmir for four seasons and I knew there is an army camp very close-by, everywhere, so I stopped outside the camp.” Had the assailants succeeded in getting into the bus, it would have resulted in a much larger crisis. July 10, 2017 was not the first serious crisis that hit the Hindu pilgrims to Amarnath, the cave shrine which is India’s most politicised faith centre in India. Key to survival for many people, off late, it built various political careers, too. It had remained a smooth, no-frills trek of faith, till the right-wingers started campaigning for it. Then the script was lost by all sides. The worst, albeit for climatic reason, was between August 21 and 26, 1996 when around 70,000 pilgrims were grounded on a slippery 32-Kms trek by mid summer snowfall. It killed 230 people including 205 pilgrims and 25 porters and a few security men. Driver Salim interacts with Governor NN Vohra. Then there were many militant attacks. On August 1, 2000, militants attacked CRPF guarding the Pahalgam base camp. A panicky paramilitary over-reacted and firing continued for a shocking 40 minutes. It led to a massacre. Of the 36 people killed, 23 were pilgrims; nine were locals, two each of cops and militants. 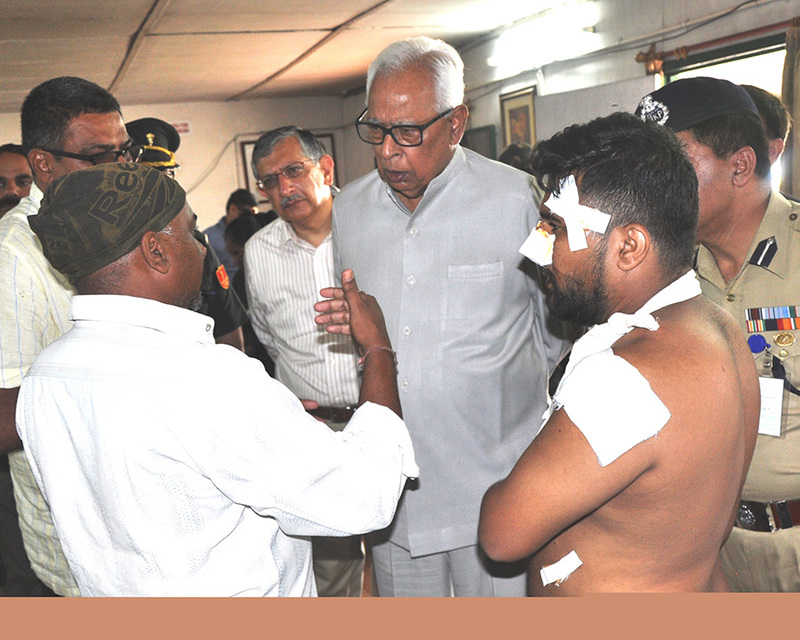 Almost 50 survived with splinter injuries, 71 were sent to hospital by the CRPF bamboos. Munir Khan, the current Kashmir police chief, was then heading the Islamabad police district. His damning report led to the setting up of a one-member Commission of Inquiry that then Corps Commander in Srinagar, Lt Gen J R Mukherjee, led. Its report came in December but nobody is sure if its recommendations were implemented. The snow blizzards of 1996 and the CRPF over-reaction were crucial to the creation of Shri Amarnathji Shrine Board (SASB) in February 2001. SASB making did not insulate the pilgrimage from the security situation in Kashmir, however. On July 21, 2001, a fierce encounter was reported from Sheshnag during dead of the night. It killed 12 persons including a suspected militant, five pilgrims and two police officers – DSP Praveen Kumar, ASI Saqi Mohammed Akbar. More than 15 persons were injured in the 30-minute long encounter. The encounter took place within 12 days after a police officer prevented a CRPF man from stealing away the donations from the cave. On August 6, 2002, according to police, two suspected militants in Gujjar attire came close to the outer fencing of the Chandanwari camp and lobbed grenades towards the latrine complex. They followed it by firing. Nine pilgrims were killed and 29 others, including two locals, were wounded. CRPF killed one of the two militants. The attack came within a week after an IED explosion at Lazbal, two kms short of Pahalgam, led to killing of two pilgrims. On June 21, 2006, when a yatra bus slowed down near Ganderbal, almost 20 kms from Srinagar, somebody tossed a grenade inside. Within minutes, the bus was in the SKIMS – five pilgrims from Rajasthan were injured. But Salim’s contribution in reducing the impact of 2017 crisis was recognised by all. State government gave him an award of Rs 3 lakh and SASB Rs 2 lakh. In Gujarat, where the right-wingers would have dominated the reactionary prime time debate, it was Salim, a marginalised Muslim who became a hero! Chief minister Mehbooba Mufti laying flower wreaths on the bodies of victims of Amarnath attack. But those few incidents did not change the larger society. At the peak of unrest in 2008, 2010 and in certain cases in 2016 as well, the civilians set up community kitchens to feed the pilgrims. A section of the pilgrims have routinely been spending many days in and around Srinagar, before and after the pilgrimage. But almost everybody was tense in Srinagar and Delhi over the attack. Part of the crisis was a possible backlash that could target tens of thousands of Kashmiri students and traders who are present across mainland India at any given point of time. But somehow, nothing happened. Barring a few small assaults on a few Kashmiris in Jammu, nothing adverse was reported. Should the ruling polar alliance stake credit for this? State government’s initial reaction was denial. The first report was two pilgrims were caught in crossfire between rebels and cops. Though everybody knew the happening, for lack of official confirmation, everybody delay, that added to the tensions in the plains. Then Omar Abdullah, broke part of the story, on twitter. By then, TV screens were on fire. As the count was finally public, mainland India started getting charged. Newsrooms started fearing “that Godhra moment” as Srinagar was exhibiting that “sinking feeling”. The government did, what it is used to, in managing crisis, blocking internet, avoiding media, adding restrictions around and “managing situation” regardless of what was happening around. Within minutes later, the political government was out. Though Kashmir Police Chief Munir Khan was already in District Police Lines (DPL) in Islamabad, the injured were moved to the hospital; the real problems were that media lacked access, images and information. Army had stopped media from getting even closer to Botengoo. Gurjarat chief minister recieves driver of the bus that came under attack. 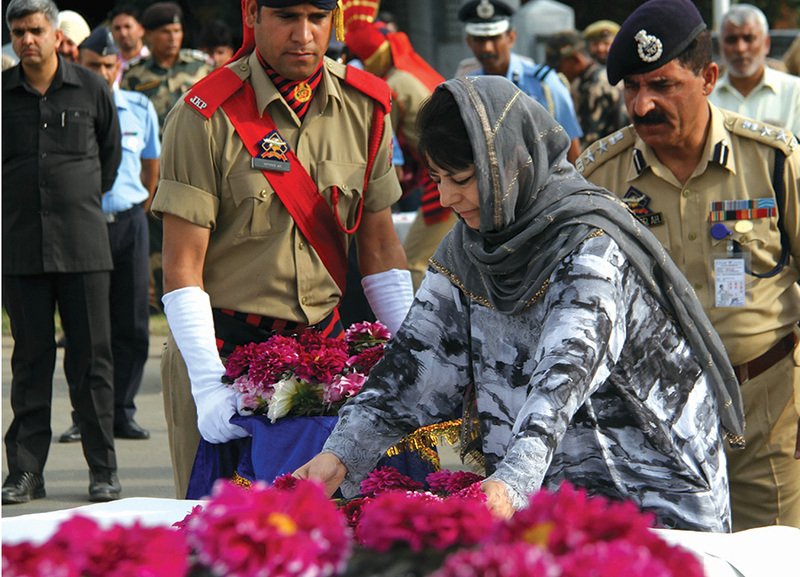 Chief Minister stayed back for most of the night and next morning she accompanied governor to the technical airport and laid floral wreaths on the coffins, which were flown to Surat in an IAF aircraft. 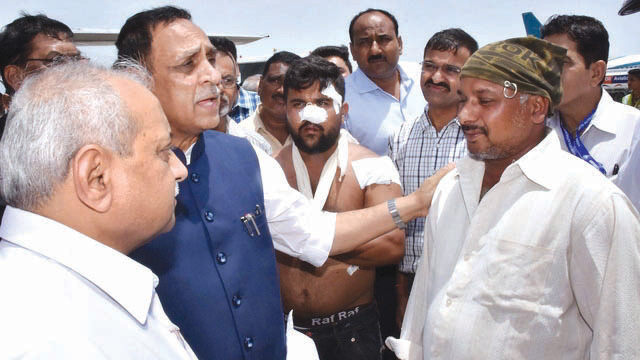 By afternoon, state had announced compensation and identified a hero from Gujarat, Salim. By then, police had announced details of its preliminary investigations holding Lashkar-e-Toiba responsible for the attack, a charge the outfit denied. As IAF touched down, cameras wanted the hero to retell the story.